The House of Representatives Parliamentary Committee for Tax and Revenue has tabled its latest bi-annual inquiry report into the overall operations of the Tax Office. The Tax Institute appeared before the Committee to give evidence in relation to members’ experiences with the Tax Office; we also detailed these in a written submission. Below are some extracts from the Committee’s report with respect to a selection of key areas of concern to members. Graduate Diploma of Applied Tax Law – get started in 2014! Enrolments for the Graduate Diploma of Applied Tax Law subjects for study period 1 in 2015 are now open. However, if you want to get started in 2014, the subjects CTA1 Foundations and CTA2A Advanced are currently open for enrolments for study period 3 2014. These two subjects are the initial steps in our Chartered Tax Adviser Program that produces tax advisers with the professional tax skills and acute commercial skills to join our growing international network of Chartered Tax Advisers. To find out more, and enrol, go to taxinstitute.com.au/education. One issue that state councils and education committees consider every year is whether to hold their state convention in, or away from, their capital city. The advantage of holding conferences in the country are that participants are more likely to attend all of the technical sessions and the social functions, and generally mix with each other far more than if the conference were held in the city. But the outstanding success of the NSW Tax Forum has provided a powerful example to other states of the benefits of holding conferences in the CBD. The main advantages are that attendances are higher, there are better opportunities for more junior people to attend, and the conference can provide participants with more alternative sessions and flexibility to attend the sessions that interest them. With the completion of the G20 Leaders Summit in Brisbane, koalas and other cuddly fauna can rest easy once more. But what were the meeting outcomes? For the keen beans, you can read the entire communiqué here. With respect to tax, the leaders committed that profits should be taxed where economic activities deriving the profits are performed and where value is created. They also committed to finalising work on the OECD BEPS Action Plan in 2015, including transparency of taxpayer-specific rulings found to constitute harmful tax practices. Finally, there was broad endorsement of the global Common Reporting Standard for the automatic exchange of tax information. There is clearly much more work to be done next year and beyond. Australia must continue to work closely with other G20 nations and the OECD on the BEPS action items to ensure that our tax laws are keeping pace with global business practices. 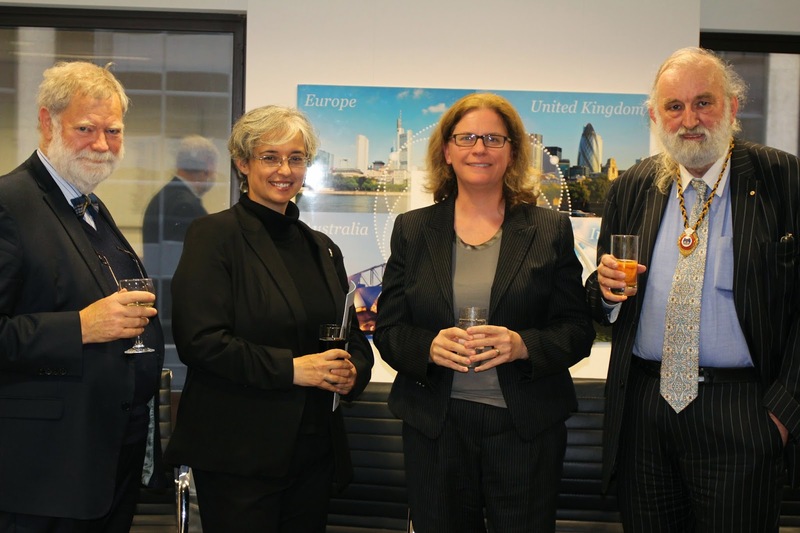 Anne Fairpo, President of the Chartered Institute of Taxation (UK), joins Sydney based UK CTA’s at a function at The Tax Institute in Sydney. Left to right: David Williams CTA, Anne Fairpo CTA, Tracy Rens CTA, Prof Gordon Cooper CTA. In the wake of recent revelations of widespread cheating at Australian universities and headlines listing widespread sharing of answers to financial services exams there is sure to be an increased focus on the bona fides of taxation education. The recent revelation that thousands of university students have been paying ghostwriters to complete their assignments highlights a disturbing phenomenon – one that whistleblower academics have been expressing increasing concern about for years: the watering down of academic standards. Where a close connection exists between education and the profession it supports, the qualification needed to obtain work and an established regulatory registration system it is important that standards are met and the credentials are not weakened through poor assessment practices. 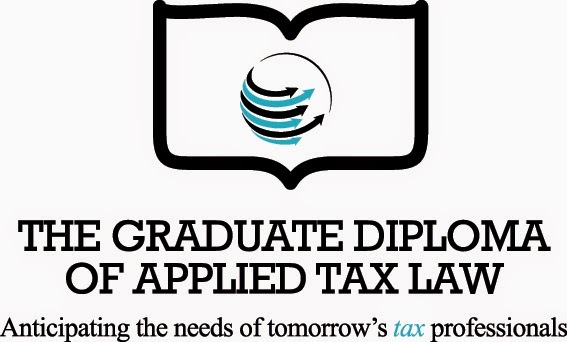 To meet the changing needs of tax professionals, on 14 October 2014, The Tax Institute launched a new postgraduate qualification, the Graduate Diploma of Applied Tax Law. It is the firm belief of the Institute and the profession that the knowledge and skills of tax professionals should be at least at a postgraduate level. The Graduate Diploma of Applied Tax Law is a high-quality offering which will meet this need while maintaining its practical and applied focus — hallmarks of all Tax Institute programs. The Tax Institute’s approach for this program was two-fold. First, it ensured compliance with the Tax Practitioners Board’s content requirements for courses in Australian taxation law and commercial law, and second, it aligned with the Australian qualifications framework (AQF) for graduate diploma level programs. To add further validation, the program was benchmarked against other providers of such programs. This weekend Brisbane will host the Group of Twenty (G20) Leaders’ Summit. The G20 comprises 19 countries plus the European Union and this year Australia is President of the grouping. Prime Minister Tony Abbott is calling this weekend ‘the most important meeting ever held in Australia’; certainly a bold claim, but in the tax space, the meeting is expected to endorse the current work on multinational tax issues and BEPS. Will there be any unexpected tax announcements? We have urged the Government not to make decisions that would put Australia at a competitive disadvantage in relation to the global business community, by moving out of step on BEPS. We must continue to work closely with other G20 nations and the OECD on the BEPS action items to ensure that our tax laws are keeping pace with global business practices. At the event, which was streamed live to boardrooms around the country, Michael Flynn, CTA, President, The Tax Institute announced that: “With the impending changes in the landscape of the profession, we need to ensure that the tax professionals of today, and those of the future, are prepared and ready to meet these changes and be equipped to handle them and continue to succeed. As noted by many, Australia’s competitive and comparative advantage is based on our ability to teach thinking and applied skills and this advantage will only be secured with education programs that deliver on this promise where it matters — in the workplace. Though the calendar year is drawing to a close, the level of activity at the Institute certainly is not. October is one of our busiest months for significant conferences and events, and ones in which I hope many members had a chance to participate. The official launch of the Graduate Diploma of Applied Tax Law occurred on 14 October 2014, and it was only made possible by the Institute achieving the status of a “higher education provider”. This is by far the most significant achievement of the Institute in education to date and one for which a number of individuals, including Professor Dale Pinto and the Institute’s General Manager Education and Professional Standards, Ruth Ferraro, deserve recognition. This week I was pleased to represent Tax Institute members at Federal Treasury’s Revenue Group stakeholder consultation meeting in Canberra. This regular consultation aims to engage the taxpaying community in a wider conversation about strategic tax policy issues. It supplements Treasury consultations on specific tax measures, with which the Tax Institute is actively involved. The meeting includes representatives from the tax and superannuation professions, business and community groups. We discussed a variety of issues at the meeting, including: Tax White Paper process;Status of announced tax measures: Superannuation, personal tax;Small business tax;Corporate and international tax;Legislation forward work program;Progress of reviews: Financial System Inquiry;Review of income streams;Board of Tax Reviews;House of Representatives Tax and Revenue Committee: Inquiry into tax disputes; andG20 Finance Minister’s meeting and BEPS. Last week we saw the Federal Government spark a national conversation about the need for nationwide tax reform, including the tax and spending mix at the State government level. The Tax Institute strongly supports this debate and congratulates the Prime Minister for calling for a mature debate on the future of Australia’s tax system. On a daily basis, tax professionals interact with a complex and unwieldy tax system that is under increasing pressure to raise sufficient revenue to meet spending commitments. True reform can only be achieved by a national conversation on the role of all taxes in our system, including the GST. Australia deserves a mature tax reform debate focussing on the country’s tax mix at both the state and federal levels that is ideally free of cheap, political scaremongering.